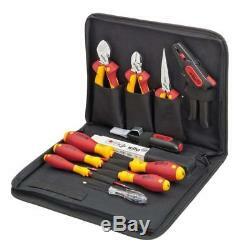 Wiha 12 Piece Electrician's Tool Set 9300-025 Steel. 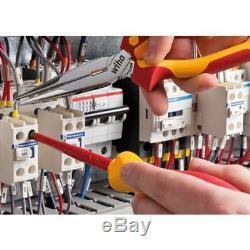 This 12-piece electrician's tool set 9300-025 from Wiha is ideal for demanding electricians. These VDE-insulated tools are very safe and can be used to work on or around electrical components with a maximum voltage of 1000 V AC. Made of high-quality materials, the tools are durable and corrosion resistant. The electrician's tool set includes 5 insulated screwdrivers (3 slotted and 2 Pozidriv), a voltage tester, needle-nose pliers, heavy-duty diagonal cutters, 2 stripping tools, cable cutters and a folding ruler. The slim blades of the electric slimFix screwdrivers ensure unrestricted, protected access to countersunk screws. The robust voltage tester is suitable for determining voltages in the low voltage range (110-250 volts). The needle-nose pliers are ideal for gripping and holding as well as cutting soft and hard wires and cables. The pliers have an extra-long plier head for inserting deep lying components. The heavy-duty diagonal cutters are ideal for cutting soft to extremely hard wires and cables. The cutters feature a special DynamicJoint design that reduces the effort required for cutting while up to 40% more cutting force is delivered thanks to the optimised leverage. The cable cutters are ideal for cutting copper and aluminium cables without crushing them and also can be used for stripping. The 2-in-1 stripping tool allows stripping without damaging the cable thanks to the automatic adjustment to the cable's diameter. It can also be used as wire cutters. 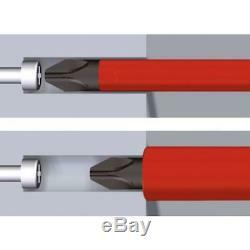 The other stripping tool is ideal for precise, fast and safe stripping of all common round cables (diameter 4-28 mm), with a self-turning inner cutter for circular and longitudinal cutting. The folding ruler is resistant to chemicals , damage and bending, and it doesn't swell with water contact. The tools are delivered in a compact, space-saving tool bag with multiple pockets and dividers. Colour: Red, yellow and black. Material: Chrome-vanadium-molybdenum steel and plastic. Tool bag dimensions: 33 x 27 x 6 cm (L x W x H). Insulated according to the VDE standard (Association for Electrical, Electronic & Information Technologies). With patented SoftFinish handle design. For work on or around electrical components up to 1000 V.
Delivered in a compact tool bag. 1 x Screwdriver SoftFinish slimFix (35446), slotted: 3.5 mm x 100 mm. 1 x Screwdriver SoftFinish slimFix (35501), slotted: 4.5 mm x 125 mm. 1 x Screwdriver SoftFinish slimFix (35391), slotted: 5.5 mm x 125 mm. 1 x Screwdriver SoftFinish slimFix (35395), Pozidriv: PZ1 x 80 mm. 1 x Screwdriver SoftFinish slimFix (35396), Pozidriv: PZ2 x 100 mm. 1 x Voltage tester SoftFinish single-pole, 110-250 volts (34745), slotted: 3 mm x 60 mm. 1 x Needle-nose pliers Professional (26727), length: 200 mm. 1 x Heavy-duty diagonal cutters Professional with DynamicJoint (26751), length: 180 mm. 1 x Cable cutters Professional (34744), length: 200 mm. 1 x Stripping tool, automatic (36050), length: 190 mm. 1 x Stripping tool (35969), length: 165 mm. 1 x Folding ruler Longlife (27057), 2 m. Excluded areas: Channel Islands, Isle of Man, Isles of Scilly, Scottish Highlands and Scottish Islands. Our customer service will be happy to help. We look forward to your positive and detailed review with 5 stars. The item "Wiha 12 Piece Professional Electrical Electrician's Tool Set 9300-025 Steel" is in sale since Monday, January 29, 2018. This item is in the category "Home, Furniture & DIY\DIY Tools\Hand Tools\Screwdrivers & Nut Drivers". The seller is "vidaxl-uk" and is located in Netherlands or.